Thank you to Alice Jaggers for running the show the past couple of weeks! I had a good vacation – a family wedding and visit – and am feeling fairly rested. More relevant to you all, is that I’m back at This Week. I wanted to make sure to point out that since I didn’t do these the past couple of weeks, there is a high chance of duplication here to the past couple of weeks. I will try to avoid it but can’t be certain. 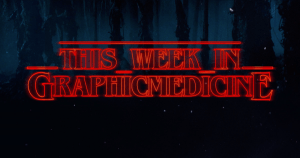 If you are another graphic medicine librarian and would like to talk about guest curating This Week in Graphic Medicine in the future, please don’t hesitate to reach out to me! You can always find me on Twitter, but also you can email me at: Matthew_Noe@hms.harvard.edu. I also want to make sure folks know that the Massachusetts Independent Comics Expo (MICE) is this weekend in Cambridge, MA (Oct 20 – 21)! I will try to track down a bunch of GM relevant stuff while there and will try to tweet about it too. Most directly important though is that a panel titled “Comics and Mental Health” is happening with A. David Lewis moderating a panel with Lucy Bellwood, Kevin Budnik, LB Lee, Rachel Lindsay, and Robyn Smith! Make sure to follow along on Twitter with @MassMICE and #micexpo2018 (I think). My first week back, I am going to put in what is probably my 80th plug for this comic, but now that it is on bookstore shelves, I want to make sure no one misses it: Hey, Kiddo by Jarrett J. Krosoczka. You can check out some recent buzz about it, including an interview, below. I’d love to hear what you think of it! This one is interesting for GM to consider. Climate Change is absolutely a healthcare issue, so there’s that, but there is also a lot to discuss here about telling people things they don’t want to hear and finding ways to get them to listen. Scholarly: A didactic approach to presenting verbal and visual information to children participating in research protocols: the comic book informed assent. Scholarly (Webcomic): Let us take care of the patient! Scholarly (Webcomic): The secrets of keeping fit: exercising and healthy eating. Narrative Medicine: Every Older Patient Has a Story. Medical Students Need to Hear It.